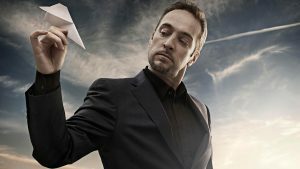 Derren Brown helps a member of public face their fears to go on an amazing journey. Will they rise to Derren’s life-changing challenge and become a hero at 30,000 feet? In Hero at 30,000 Feet, Derren took a man named Matt who was stuck in a rut in his life and coached him to take control of life and achieve his aspirations. The programme was divided into chapters to introduce different stages in the transformation, many of which were undertaken without the Matt knowing of Derren’s involvement (via cooperation with his parents and girlfriend to set up cameras in his house). At one stage Derren visited Galley in the middle of the night, but left the subject believing it was a dream. During the programme Matt was put through a series of challenges: being the victim of an armed robbery, touching a live crocodile, illicitly entering a policeman’s home, lying strapped to a rail track in a straitjacket while a train approached (the first challenge when he knew he was awake and that Derren was involved in this). The show culminated in Matt travelling on a plane where the pilot had supposedly been incapacitated. Matt, who had not been on a plane in ten years and had a fear of flying, boarded a flight travelling from Leeds to Jersey, where he had been told that a fake game-show presented by Derren was to be filmed. The flight crew, stewards and stewardesses were real, but the rest of the passengers were actors. During the flight, the cabin crew announced that the captain had been taken ill and asked for a volunteer to land the plane. At the last minute, Matt volunteered. While walking up to the front of the plane he was placed into a trance by Matt. After the plane landed, Matt was placed into a cockpit flight simulator and woken up. He was talked through landing procedures by a person identified to him as an air traffic controller. Matt completed the challenge successfully and then emerged from the simulator to meet Brown and all the actors involved in the programme, plus his family and friends. Hero at 30,000 feet is available on Channel 4’s All 4 On Demand service. Alternatively you can stream via Amazon Video.